According to the Whatcom County, Washington, website... 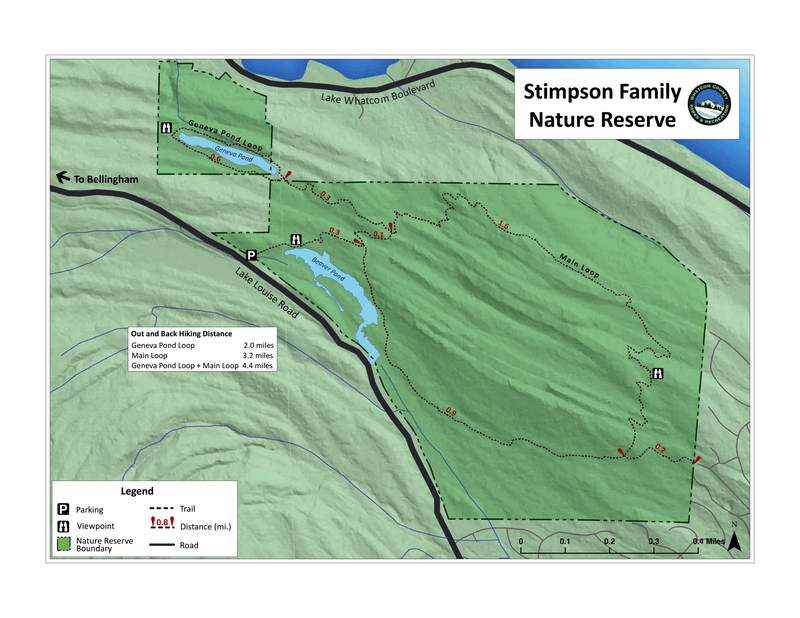 The Stimpson Family Nature Reserve offers over 4 miles of hiking trails through a beautiful forest setting. The forest is largely undisturbed and displays characteristics of an old-growth forest, including Douglas Fir trees over 400 years old, a wide diversity of tree species, snags and decaying logs, and a complex architecture of canopy, understory, shrub layer, and tapestry of the forest floor. Two ponds and additional wetland areas support a wide variety of plants and animals, including beaver. Deer, cougar, and smaller mammals frequent the park. While visiting friends up in Bellingham, WA, we wanted a nearby hike that fit everyone's interest and ability level. The Stimpson Family Nature Reserve was just the ticket. After a 30 minute drive from our friends' home in north Bellingham we grabbed our water bottles and donned sunglasses. We chose to take the 2.8 mile Main Loop hike. The trail was well maintained and wide enough for people to walk side-by-side and chat. There was an occasional small elevation gain/loss and several benches available if you wanted to take a rest. Despite it being mid-August, the forest provided such ample shade that the sunglasses were unnecessary. Check out Mallard Ice Cream shop in downtown Bellingham for a post-hike treat! Note that dogs and bicycles are not allowed. 3 min (1.5 mi). The address for the Nature Reserve is 2076 Lake Louise Rd. Bellingham, WA 98229.